Pepperoni is a spicy Italian-American variety of salami made from cured pork. However, Halal or Kosher Pepperoni may be made from beef. It is a descendant of the spicy salamis of Southern Italy, such as salsiccia Napoletana piccante, a spicy dry sausage from Naples or the Soppressata from Calabria. 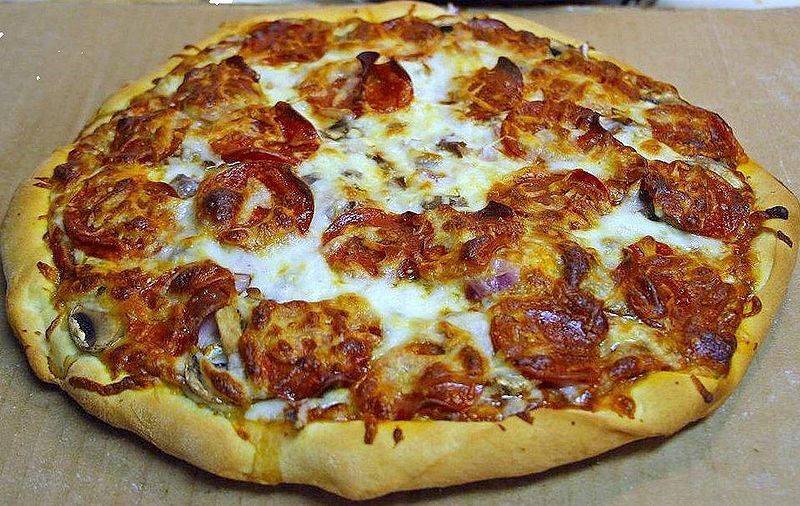 Pepperoni is a popular pizza topping in American-style pizzerias. Also, it is sometimes used to make sub sandwiches. To order the American version of pepperoni in Italy, someone would request salame piccante or salamino piccante (hot salami, generally typical of Calabria). The Italian name for a pepperoni pizza is pizza alla diavola (with hot sausages). Throughout continental Europe, peperone is a common word for various types of capsicum including bell peppers and a small, spicy and often pickled pepper known as peperoncino or peperone piccante in Italy and pepperoncini or banana peppers in the U.S. Sodium nitrite, used as a curing agent, is what gives pepperoni its distinct orange-pink color.